With an unprecedented number of domestic violent deaths in Minnesota, a candlelight vigil was held to honor and remember the victims; predominantly women victims; including Mandy Matula of Eden Prairie, who was recently recovered after being missing for 6 months. 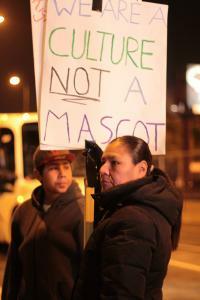 A somber and determined group of 100's walked through Minneapolis to the H.H.H.Metrodome to continue the protest against the use of native mascots. The gathering was peaceful and meaningful. The cold weather didn't stop the crowds as they walked for a cause that goes beyond culture. The American Indian Movement of Minnesota, with Director, Clyde Bellecourt, coordinated this intense event during an NFL game between Minnesota and Washington. 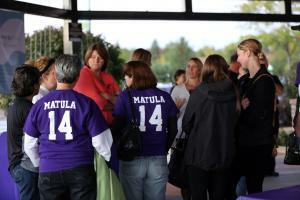 "Change the Name" echoed throughout the walk and also at the Metrodome. Next Event: The Minnesota Star Ball will be held this year on May 6th, 2012. If you are dancing in this competition and need prints, I'll be displaying them and selling them here on this web site. Model releases will be available at the Ball for all dancers to sign and any personal, one on one portraits can be scheduled in throughout the day's events. You may contact me through email at kdpurdy@gmail.com.